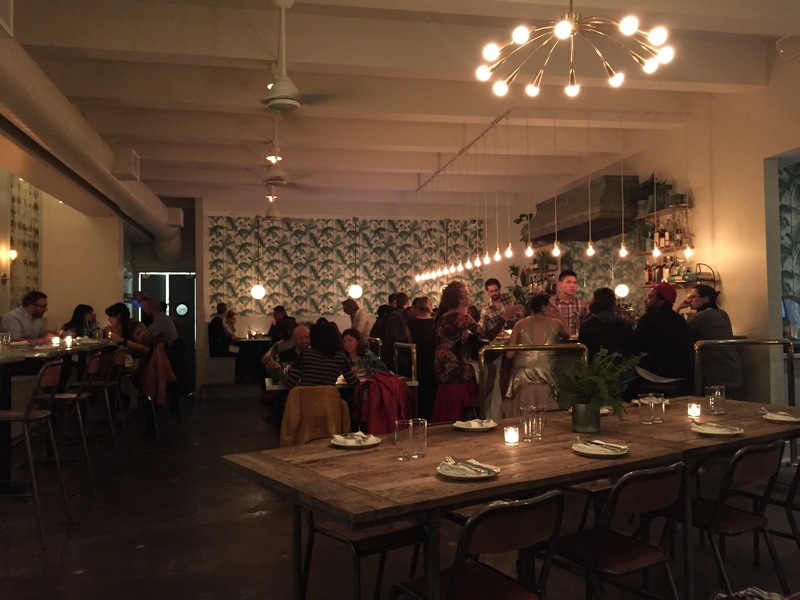 I feel like even just 6 or 7 years ago when my husband and I moved back home from San Francisco, we felt like Seattle had some serious catching up to do in terms of the restaurant scene, but today I think a lot of cities need to catch up to us. I’m happily floored by the chefs that have emerged and all the different cuisines that are popping up. 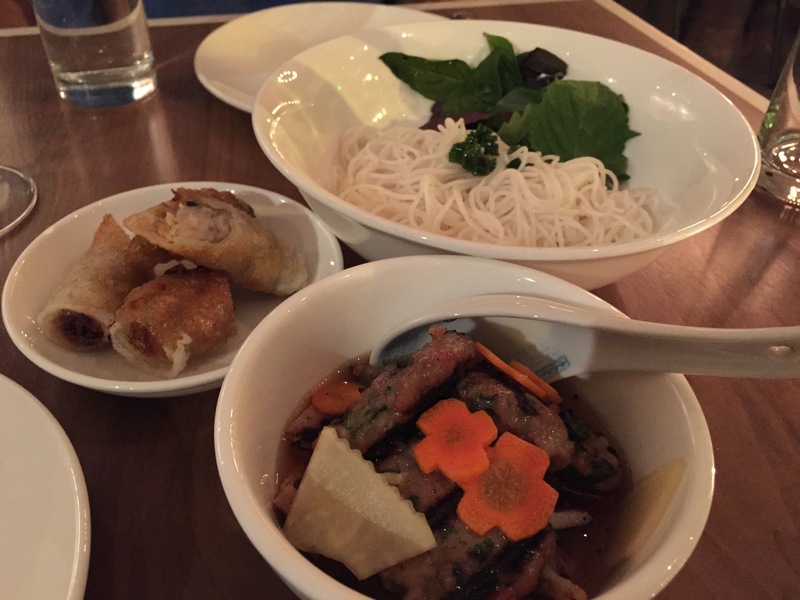 A French Vietnamese restaurant, Stateside’s chef/owners have planted themselves in the heart of Capitol Hill’s restaurant scene (at least the one on the west side – there are many) and have created such a fun environment. Tropical wallpaper mixed with reclaimed wood tables, it’s a good mix and a great backdrop for some pretty awesome food! 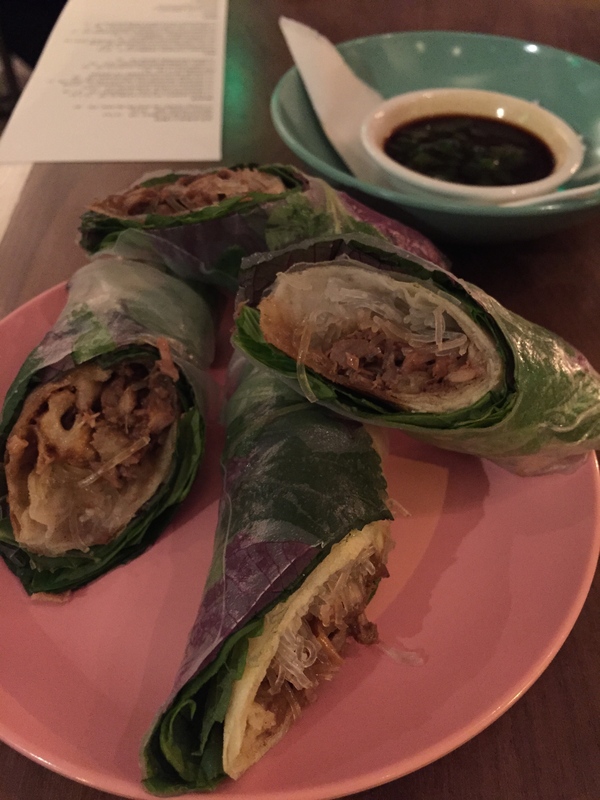 We started with the Crispy Duck Fresh Rolls (duck rolls wrapped in fresh herbs and rice paper) which were very good. Fresh flavors from the herbs, great texture from the crispy duck…all in all I would get these again no doubt about it. 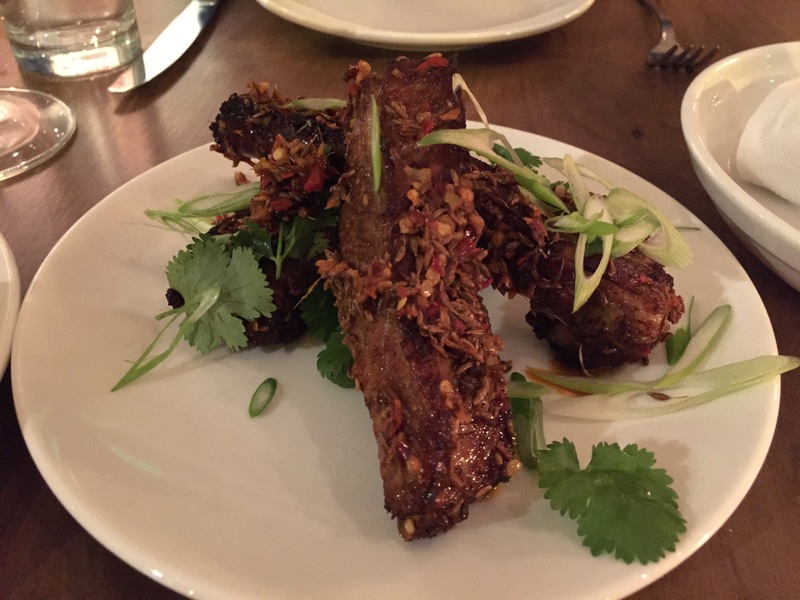 Next were the Chili Cumin Pork Ribs (a bit spicy or extra spicy). We chose a bit spicy but I think I’d go extra spicy next time. I just wasn’t sure what to expect so we played it safe. The ribs were perfectly cooked…the meat was so tender and moist. The spices were great…different than your normal ribs but I like the change. The fresh cilantro on the side is a great addition too! 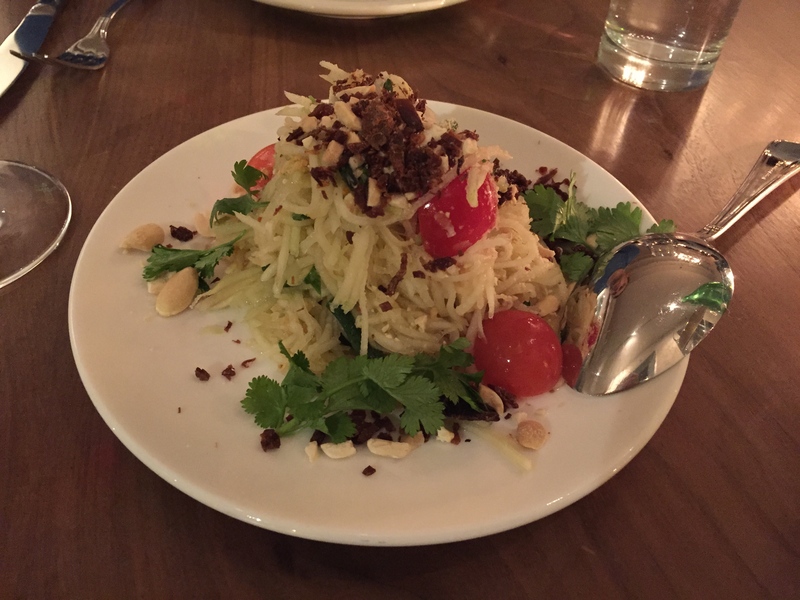 The Green Papaya Salad was calling my name – sooo good if you like green papaya salad. Long beans, tomatoes, lime, chili, dried shrimp (didn’t even notice them) and beef jerky…whaaaa?! Crazy right?! No…amazing! They do note that it can be made vegetarian. Unless you are one don’t do it:) Everything about this was perfect. Slightly spicy, fresh, crunchy peanuts on top…YUM! 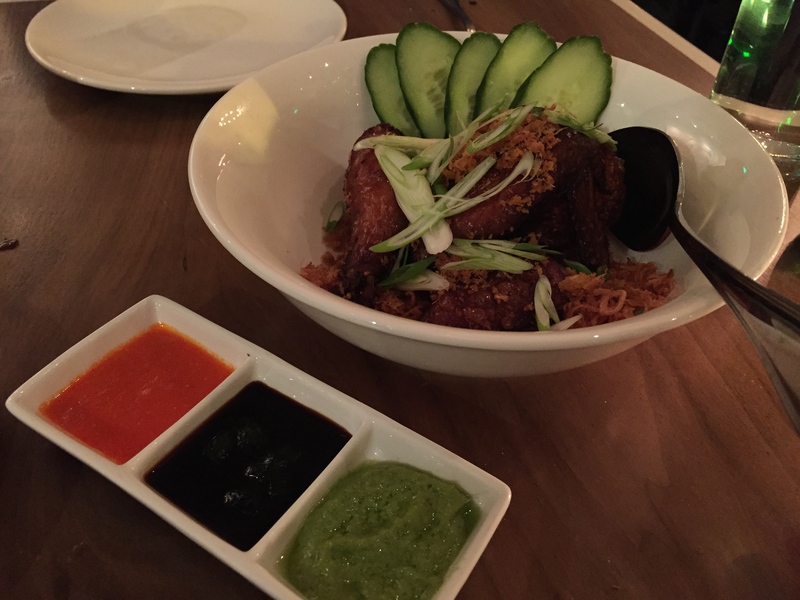 The Master Stock Crispy Chicken (free range chicken poached in aromatic stock, then fried crispy) sounded too good not to try. And different. It came with three dipping sauces (I can’t remember them now sorry) and was topped with scallions and something fried like tempura bits but I can’t recall that either – my apologies. Great dish! The flavors are so different and well matched that I’m having a hard time describing them. Last but not least was dessert. The only tragedy here is that ever since having a baby I’ve completely lost the ability to remember anything worthwhile therefore I need to write everything down and I didn’t in this case. 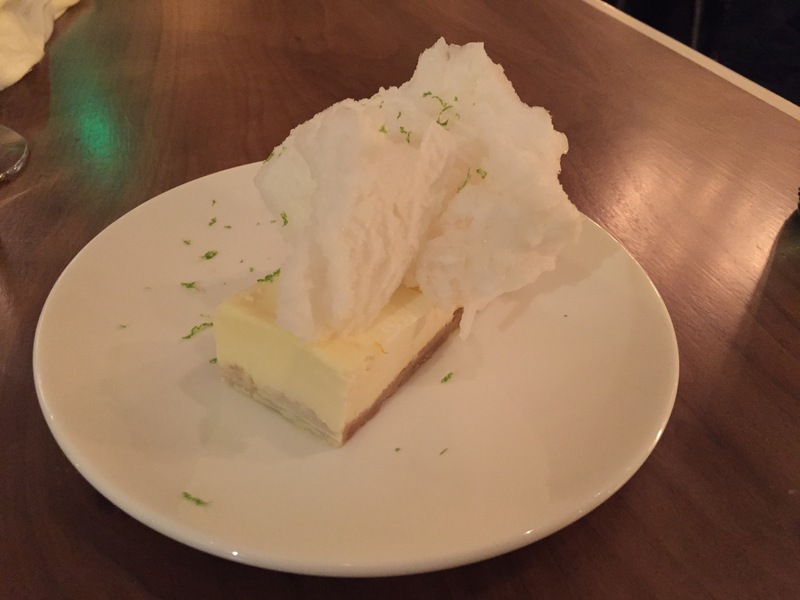 SO…I have no idea what it was we ate but I can tell you this…it was the most incredible dessert and I would go back for just it. I realize I’m not helping you out here but at least you can reference the photo and see if anything looks similar on the menu.